The Cubs Next James Russell(s)? James Russell has been one of the most consistent pieces of the Cubs inconsistent bullpen over the last three seasons, and there may be more from the same mold coming down the pipeline. I'm not necessarily talking about Cubs minor leaguers with similar pitching repertoires to Russell but, instead current starters in the system that will likely produce most of their big league value out of the bullpen. Theo Epstein and Jed Hoyer often reference the theory that sometimes the best relievers are failed starters. In Russell's case, he wasn't necessarily a colossal failure as a starter. However, it was quite clear that even as a starter coming through the ranks, he would ultimately be moved to a reliever role. Russell was predominantly in a starter's role from 2007-2010 in the system, racking up 40 starts out of 71 appearances before getting a shot in the Cubs pen in 2011. There are others in the system that may mirror the path that Russell took. Here are a few of them in no particular order. Keep in mind that I focused solely on guys in the upper minors, so I did not include pitchers such as Zach Cates and Corey Black. Chris Rusin - Rusin has already been mentioned this spring as a candidate for the fifth spot in the rotation with Jake Arrieta potentially not being ready for Opening Day, but his long-term future will be as a reliever/occasional spot starter (As we know the Cubs like to have a high quantity of stretched-out arms due to the amount of pitchers that will likely have to start at least once in a given season). Fans are fairly familiar with Rusin, who pitched well to a tune of a 3.93 ERA and 1.357 WHIP (4.75 FIP though) in 13 starts for the Cubs in 2013. If the Cubs decide to move Russell this year and go with a cheaper LOOGY alternative, Rusin could slide in nicely. Alberto Cabrera - Cabrera still might have a future in the rotation but his inconsistencies in that role might have him better suited coming out of the bullpen. The Cubs have moved him back-and-forth between starter and reliever, but the majority of his time has come while taking the ball every fifth game. Out of the pen, he can touch the high 90s with nasty sink if he finishes his delivery properly. The stuff is there. Having been around the Peoria Chiefs in '09, the Cubs front office and minor league coaches told me that out of anyone on the Chiefs staff, Cabrera had the highest ceiling of anyone. That staff included Chris Carpenter, at once a top 10 Cubs prospect, and Chris Archer, who was runner up to AL Rookie of the Year and was named AL Pitcher of the Month in July 2013. Pretty good marks for Cabrera. 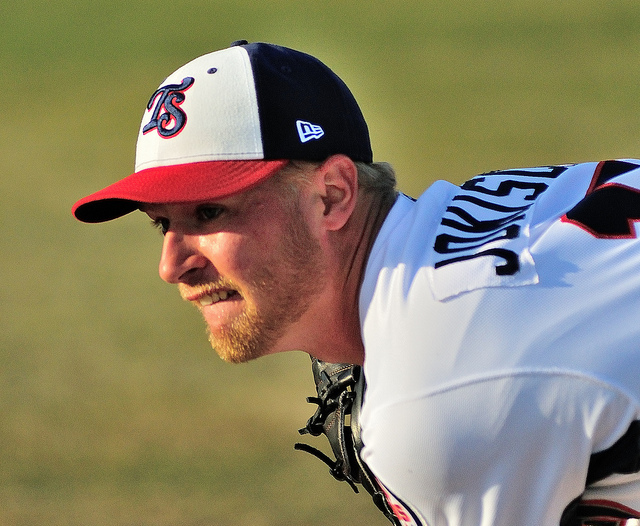 Eric Jokisch - Jim Callis of-then Baseball America and now MLB told me at the time that Eric Jokisch was the Cubs best sleeper pick of the 2010 draft when they selected him in the 11th round. Jokisch has that extremely high mental makeup thing that everyone seems to be talking about nowadays. Also, the lefty has flat-out posted some strong numbers in 73 starts (97 appearances) in four seasons in the system, including ERAs of 2.91 and 3.42 the last two seasons in Tennessee. While his BABIP was pretty low the last couple years and the numbers were flattering to the way Jokisch actually pitched, it still must be noted how well he has progressed. The fact of the matter is, though, is that Jokisch might simply not throw hard enough to become a steady rotation piece and could be very well ticketed for the pen in the future. Dae-Eun Rhee - Rhee was a top five Cubs prospect going back to 2008, but has battled injuries and inconsistencies ever since. He's coming off a very good but limited 2013, posting a 2.90 ERA and 1.065 WHIP in 15 starts between Mesa, Boise and Tennessee. Rhee can touch the mid 90s and if his arm can't ever quite take the toll of 150+ innings, the Cubs may consider finding a new role for the right-hander. Neil Ramirez & Justin Grimm - While C.J. Edwards is considered the main "get" in the Matt Garza trade, both Ramirez and Grimm could compete for a bullpen this season despite 183 combined minor league starts between the two of them (17 starts for Grimm too with the Rangers). Hoyer already said Grimm has been working with the relievers this spring and could potentially fill a very prominent role in the Cubs pen. Other possibilities include right-handers Nick Struck and Matt Loosen. The Cubs have done a nice job stockpiling some young, powerful bullpen arms in the system such as a Arodys Vizcaino, Tony Zych, etc. However, the starters mentioned above could also become good fits warming up down the left field line at Wrigley on a regular basis. Nice to see Jokisch on somebody's radar. I'm a fan, but I'm not convinced his mental makeup is conducive to a LOOGY. Jokisch strength is ability to get opposing hitters to get themselves out by pitching to contact, and his consistency by avoiding trouble with runners on base. Also, his circle change is an effective strikeout pitch. The result to this point is an innings eating starter who keeps his team in games. It will be interesting to observe his success going forward.